Often, the placement of self-consolidating concrete (SCC) in mat foundation and huge wall elements demands the casting of concrete in multiple lifts that can result in lift line formation, which in turn could lead to structural deficiencies and aesthetic defects. There is indeed a crucial need to produce recommendations in order to enumerate bond strength across lift lines in multilayer construction and also design SCC mixtures with the essential rheological characteristics to alleviate this phenomenon. This investigation provides guidelines that will help examine residual bond strength in multilayer casting for SCC of varied thixotropic levels. Construction planners and material engineers could develop an interest in minimizing the impact of delay in casting successive SCC lifts and designing SCC with adapted rheology. The standard workability test methods are capable of providing a major contribution to the increasing demand of quantifying the structural buildup at rest of concrete, which indeed is a challenge for quality control of SCC on jobsites. SCC mixtures proportioned with a wide range of materials and designed to produce varied hardened and fresh characteristics were prepared. The structural buildup at rest was established by assessing the differences in the values of workability parameters; J-ring flow, T50, and slump flow; over specific periods of rest up to 60 minutes. Composite specimens cast with two lifts of SCC after rest helped determining the bond between successive layers. The slant shear and direct shear test setups were used to determine bond strength. A delay time between the casting of the first and the second layers was set to a maximum of 60 minutes in both testing methods. The second layer of SCC was made up of concrete that was correctly mixed without any rest, which would characterize actual concrete practice. A few samples were cast in one layer in order to secure monolithic conditions and these samples are considered as control samples. All samples were tested under uniaxial compression after seven days of moist curing. The slanted shear test method is extensively used to assess bond strength of resinous repair materials to concrete substrates and deals with casting a cylindrical sample made of two identical halves bonded along a slant phase of 30° from the vertical direction. The interface between the two concrete layers was oriented in the horizontal direction during casting in the direct shear test method, and then the layers were oriented in the vertical direction during testing. Using such vertical direction during testing will help prevent stress concentration at the edge of the bond plane, which is crucial for reducing the scattering of bond strength results. Unlike the slant shear test, the fabrication of the direct shear test samples is simple and saw-cutting of the sample is not needed before testing. The outcomes highlight that both residual bond strength test values reduce with the increase in delay time between successive SCC layers. It has been observed that the delay time decreases with the increase in structural buildup at rest of the freshly cast SCC. The maximum allowable delay time needed to secure sufficient bond strength and determined under slant shear strength is greater than that of the direct shear bond strength needed for SCC of a given thixotropic level. Almost 55 minutes is considered to be the difference between delay time values determined using the slant and direct shear stress test methods when SCC mixtures that have low level of structural buildup at rest are used. However, the spread in delay time is expected to decrease considerably to secure adequate bond strength when the SCC is highly thixotropic. The residual bond strengths, determined under slanted and direct shear stress, drastically reduced to 56% and 15%, respectively, for the SCC mixture that had the greatest level of structural buildup at rest. It was observed that the residual strength determined by the direct shear strength test was increasingly sensitive to defects that can be present at the distinct layer between the two SCC lifts than the slant shear strength. SCC mixtures with low level of structural buildup at rest are recommended for casting elements of bigger dimensions or those where a specific delay is expected before casting successive layers. Such SCC can have a rate of loss in slump ﬂow at rest of 1.20 mm/min (0.047 in./min) and a minimum initial slump ﬂow of 630 mm (24.8 in.). Such concrete can display exhibit low viscosity with an initial T50 of 1.60 sec or less and a rate of increase in T50 at rest of 0.045 sec/min or less as well as a minimum initial J-ring ﬂow of 630 mm (24.8 in.) with a rate of drop in J-ring ﬂow values at rest of 0.85 mm/min (0.033 in.) or less. The minimum residual bond strength established under slant and direct shear stress can be 97% and 92%, respectively, when the delay time between castings of successive layers of such SCC Category is 15 minutes. It is possible for the static yield stress of the SCC to increase, after a specific period of rest, and then reach a crucial value that prevents it from intermixing with the next lift of concrete, thus bringing about a decrease in surface roughness between layers. 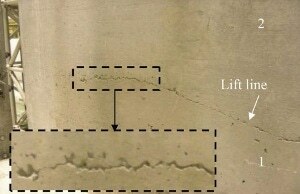 It is also possible to enhance the surface roughness by increasing the free-fall height (FFH) of the new layer onto the existing material, which could lead to a decrease of its yield stress. Such FFH should be applied to prevent bleeding or segregation, which can have an impaired bond between successive concrete layers. The increase in FFH of SCC belonging to the concrete category highlighted in advance led to an increase in residual bond strength from 76% to 86% when the top layer was cast after a delay time of 60 minutes. The increase in bond strength with FFH can be associated with an increase in the level of aggregate interlock resulting from higher surface roughness at the interface with the lower concrete lift. The research, presented in a paper titled “Bond Strength in Multilayer Casting of Self-Consolidating Concrete”, has been published by ACI Materials Journal.